The Water Authority program underscores the importance of water reliability to the region’s core industries, focusing on examples including tourism, manufacturing, agriculture, and craft brewing. Watch video of the Brought to You Be Water kickoff event. 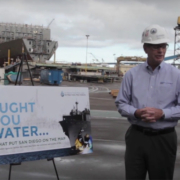 The event also showcased the release of a new San Diego Regional Economic Development Corp. (EDC) report highlighting the multi-billion-dollar economic impact of safe and reliable water supplies. The EDC report underscores the importance of regional investments in clean, reliable water supplies to the San Diego region. It focused on more than $2.4 billion invested by the Water Authority in five major water reliability projects over the past two decades. Those projects generated $4.8 billion in total economic impact, supporting an average of 1,475 jobs annually over two decades and creating more than $1.8 billion in local wages and salaries. The report also found that access to safe and reliable water supplies supports $482 million in total regional sales of goods and services daily. “This figure is equivalent to the economic impact of nearly three Comic-Cons a day,” said Janice Brown, EDC board chairperson. In addition, the report shows more than 2,800 people work in the water and wastewater sectors at the Water Authority and its 24 member agencies. The water industry provides career opportunities across all levels of educational attainment, in everything from customer service to engineering. 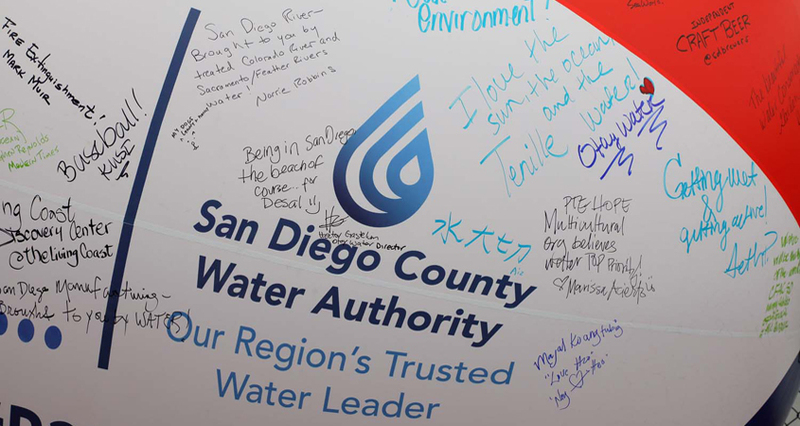 The Water Authority’s yearlong Brought to You by Water educational program explains how San Diego’s thriving economy and quality of life are all made possible by the safe and reliable water supply provided by the Water Authority and its 24 retail member agencies. 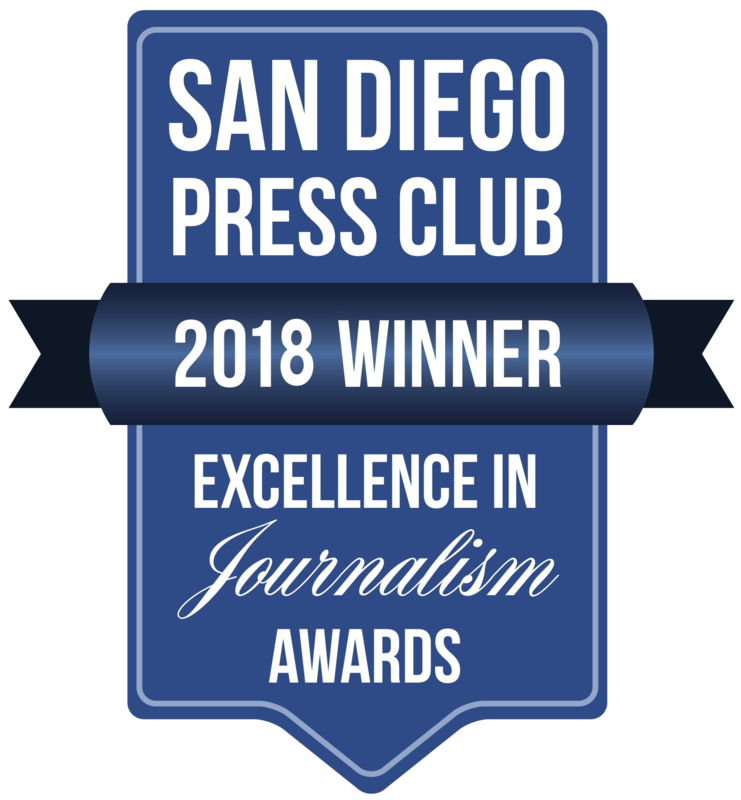 San Diego’s $17.9 billion tourism industry took center stage at Thursday’s event on the popular USS Midway Museum, with representatives and displays from the San Diego Tourism Authority, San Diego Zoo and Safari Park, LEGOLAND California, Balboa Park, Living Coast Discovery Center, the USS Midway, and additional attractions. San Diego County attracts 35 million visitors annually, including 17.3 million hotel nights a year, more than 100 major conventions, and 194,000 tourism jobs. “Think about the pools, think about all of the attractions, think about the great parks. Balboa Park would not be Balboa Park without the opportunity to use water,” said Joe Terzi, President and CEO of the San Diego Tourism Authority. Manufacturing: Nearly every one of the San Diego region’s groundbreaking 4,000 manufacturing facilities relies on water for washing, fabricating, cooling and other processes, which generate $23 billion in economic activity across 300 industries from world-famous guitars to Navy ships. Craft Brewing: San Diego is justifiably proud of its $870 million a year craft brewing industry. But no one would enjoy a single pint wouldn’t be possible without safe and reliable water. Coffee: Beer isn’t the only beverage making an impact in San Diego. The region is also home to a burgeoning coffee industry – another sector that values water as a core ingredient. Agriculture: San Diego County’s farms produce nearly $2 billion annually in sales. Our region’s temperate climate and reliable water supplies support 5,500 local farms on more than 250,000 cultivated acres – plus numerous farmers markets, restaurants and grocery stores stocked with our local bounty. 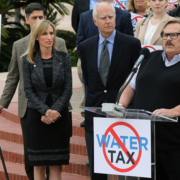 “Over the next year, the Water Authority and its member agencies will make a special effort to highlight how our safe and reliable water supplies are critical to our economy, and quality of life,” said Mark Muir, Water Authority board chairman. 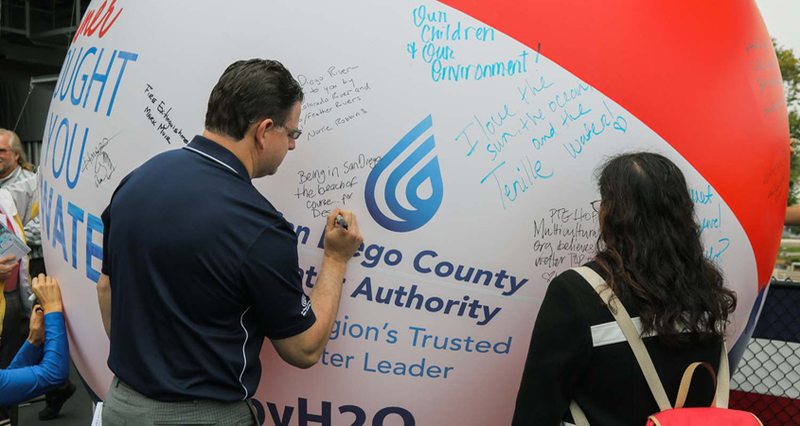 The Water Authority will participate in regional events for industry sectors, along with street fairs, farmers markets and other opportunities to talk about water with residents in the coming months. These events will feature a highlight of today’s kickoff, a giant beach ball – eight feet in diameter – branded with the Brought to You by Water logo and signed by guests at the conclusion of today’s event.